UpdraftPlus, the world’s most popular backup plugin, has today confirmed it has acquired WP-Optimize, a plugin for cleaning up WordPress databases. The takeover will bring together a user base of well over 1 million WordPress sites, making it one of the largest WordPress companies in Europe, something that excites both David Anderson, founder and lead developer of UpdraftPlus, and Ruhani Rabin who created WP-Optimize. The acquisition underlines UpdraftPlus’s strategy to build an ecosystem of backend plugins that can be managed by their remote control product called UpdraftCentral to rival ManageWP, WPRemote and Calypso. WP-Optimize is a popular and highly-rated free plugin that runs automatic clean-ups on WordPress databases so that they run at maximum efficiency without the need for manual requests. It was founded 8 years ago out of Rabin’s desire to simplify the process of WordPress optimization. From experience, he understood the importance of removing redundant data in order to keep databases clean and efficient. He also found this process tedious, time-consuming and technical, and so he developed a plugin that would make things simple, quick and automated. And so WP-Optimize was born. 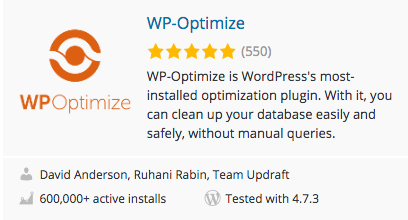 WP-Optimize worked well; users rated it highly, and its popularity spread. Today, it’s used on over half a million websites, something Rabin finds “inspiring, thrilling and at the same time, terrifying.” Rabin felt a huge responsibility not just to maintain the plugin and deliver a high level of support, but also to keep up the creative innovation. It was too much for just one man, and a lack of time and resources meant Rabin was unable to carry out his many ambitions for WP-Optimize’s expansion. David Anderson was once in the same position. UpdraftPlus’ popularity took him by surprise, and he built a team around him out of the realisation that it would require more than ‘curiosity and a hobbyist’s obsession’ to drive the plugin forward. Since then it has become the most installed British WordPress plugin. He feels this same team could also benefit WP-Optimize, speeding up its pace of development and giving it a ‘new breathe of life’. UpdraftPlus had just what Rabin was looking for: “a group of people who were enthusiastic and driven to take on this product and evolve it to the next level.” Rabin trusted that WP-Optimize would be a perfect fit within the Updraft Plus family of products. UpdraftPlus has just released a new version of WP-Optimize, which has already had ‘a complete re-factoring of the plugin’s internals, to lay a solid foundation for future improvements.’ Although it looks the same outwardly, it’s been modernised and solidified, although this is only the beginning. Anderson is excited by the opportunities to further develop WPO so that it makes websites ‘even leaner and faster’. In addition, he wants to add full multisite support, a premium version with additional features, and the capacity for users to control it remotely through UpdraftCentral. Rabin will remain involved, taking on an advisory role in this development. The post UpdraftPlus confirms it has acquired WP-Optimize appeared first on UpdraftPlus. UpdraftPlus – Backup, restore and migration plugin for WordPress.